Yesterday, zombie survival sim DayZ hit one million players, and the zombie population couldn't be happier. Actually, they're not happy at all. 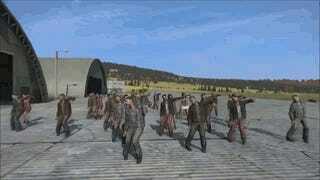 They're being forced to do this—by none other than Viktor Kostik, the lead animator of DayZ, who decided to throw together a short dance video to celebrate this milestone in the game's history. Give it a watch below.